I am a big fan of wrist straps for my cameras. I use them just about all the time compared to rarely using a neck strap. I first started using a wrist strap when I got into “street photography” because it was a secure way to carry a camera without anything getting in the way of speed and shooting, but now I use them all the time. Also, when using a tripod there’s not a big neck strap hanging in your way – the wrist straps are just smaller and more convenient for my style of shooting. My old wrist strap of choice was the Gordy’s brand. These are basically just a thin loop of leather that simply goes around your wrist, in black or brown with your choice of a few colors of thread that created the smaller loop on the end that attached to the camera. I also have used the BlackRapid wrist strap also which connects to the same attachment piece that their body straps connect to. Nothing wrong with either of these straps, but neither are going to necessarily earn any “style points”. A few months back I came across a different kind of strap made by a company called Lance Camera Straps. The Lance straps have quickly replaced all the others as my strap of choice. The company is U.S. based and their products are Made In The U.S.A. 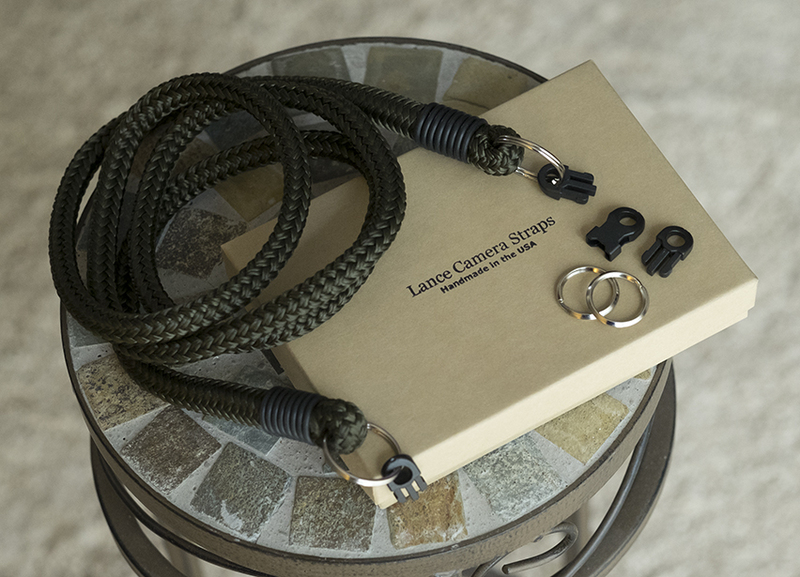 The Lance straps are made out of a premium polyester “rope” material that is both very strong and very comfortable. They come in Black, Red, Burgundy, Dark Blue, and the color that I was after when I discovered them – Olive Green. I was after an Olive Green colored strap to go with my newly acquired Fujifilm X100T because I was using an Olive Green Kaza leather case and I also had an Olive Green shutter release button. The rubber “o-rings” are black no matter what color strap you order. I initially ordered an Olive Green Lance “Lug” Wrist Strap and when it arrived I couldn’t have been happier. Not only was it the color I needed, it was comfortable, well made, and did it’s job perfectly. The material reminds me of “sailing rope” or something like that…very strong, but smooth and silky to the touch. The design of the strap is great…by sliding the loop you can make it as tight or as loose around your wrist as you want, and if you drop your camera out of your grip, the weight of the camera will “cinch” the loop around your wrist tighter automatically to keep it on your wrist. It’s really cool. I then decided to get a matching neck strap for the rare times that I want to go with a neck strap instead of a wrist strap. I went with the Lance “Non Adjust” Neck Strap in the 48″ size and received it just as fast as the wrist strap got to me – 2 days. You can also get a 36″ length, or even a custom length neck strap which is what I might do in the future. I’d like to get one long enough to wear across the body like a messenger bag, and then if I want to use it like a regular neck strap I could just use a butterfly knot or something similar to shorten it. I then had to come up with a way that was easy to switch back and forth between the two which is how I found the “pinch-style” quick release buckles that I now use on all of my straps. They are very strong plastic so they are lightweight and won’t harm any equipment and they are very secure. I have tested them and found them to be more than adequate for my intended use of them. I also use 5/8″ steel split rings to attach the releases to my cameras with a small, thick rubber O-Ring around the camera lug…you can see this if you look closely to the top picture. I have 1/2″ split rings on their way to me and will probably switch to those as they will be even more streamlined and small. After getting the Sony A6000, one of my first additions was another Olive Green Lug Wrist Strap, which I have attached to the camera the same way. After getting my new Fujifilm X-T10 in the two-toned silver & black, I got a third Olive Green Lug Wrist Strap and had it for a day when I thought to myself that a silver-gray version of the strap would look perfect with the aesthetics of the X-T10 body. That color is not one of the available colors from Lance, but after discussing this with one of Lance’s super helpful employees, Max, I ended up being able to get a special gray colored Lug Wrist Strap which I just received and it looks fantastic on my X-T10. It looks so great, I may have to contact Lance and beg them for a gray neck strap now…a custom length, long strap in the gray color is definitely on my wish list!! These days, you can spend a fortune on wrist and neck straps so it’s very nice to find a company that makes such great quality products that are priced great. The Lance Lug Wrist Straps are only $26 and that includes shipping (in the U.S.)! Their neck straps are just as nicely priced.